There is perhaps no better way to explore the beautiful possibilities of exceptional modern architecture than by referring to homes designed by Phil Kean. The internationally acclaimed architect and his much-awarded Phil Kean Design Group are renowned for stunning and very livable modern home designs that create a seamless harmony between indoor and outdoor living. “We are committed to thoughtful, innovative, sustainable architecture,” says Kean. But the excitement really comes in discovering the new ways the Orlando architect finds to employ the classic modern tenets of good lighting and spatial functionality. Warm colors, exquisite details and sense of inviting drama set PKDG homes apart as masterworks of luxury and comfort. A modern house designed by Kean is the antithesis of the “cold, stark, big blank walls” stereotype. Modern homes designed by Phil Kean Design Group are sited to make the most of the land’s topography. This showcases invitingly impressive elevations. It also determines how natural light moves through the interior, enhancing the rhythm and flow of how the home lives on a daily basis. Extensive use of low-e floor to ceiling sliding glass doors in kitchens, living areas and master bedrooms create the luxurious indoor/outdoor living experience today’s home buyers require. Whether in a room designed for entertaining or to add romantic ambience to private spaces, blurring the lines between indoor and outdoor living is a PKDG hallmark. Minimalist interior design in the hands of PKDG relies on, “Finding the absolute perfect balance that is ‘just enough’ but not too much,”says Rob Turner, President of PKDG’s Interior Design department. To create award winning minimalist interior design, Turner combines the latest in sustainable materials and natural organic components. His exquisite details radiate a one-of-a-kind warmth, texture and character. Beautiful woods and natural stone may come into play in the interior and be echoed in surprising touches outdoors. 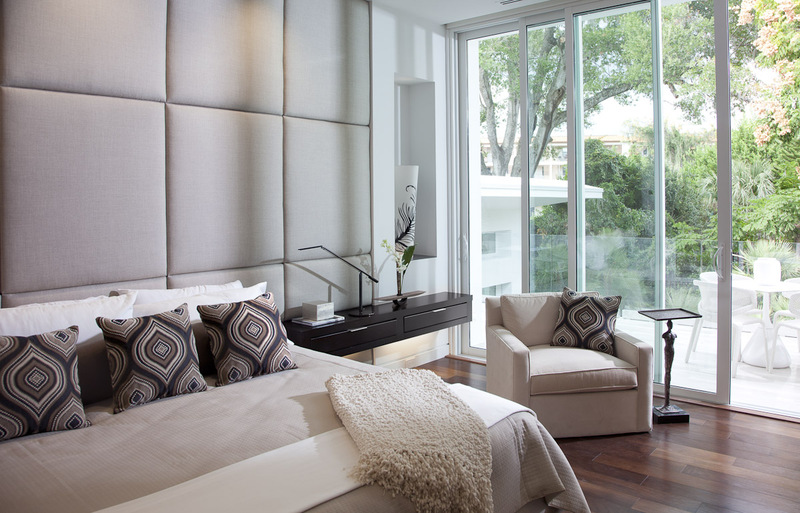 Design elements such as upholstered bed walls and LED backlit floating ceilings add softness and drama. One thing is sure; every PKDG modern home design is a superb example of classic modern home custom home that deliver a thoroughly new, amazingly comfortable and totally luxurious experience.